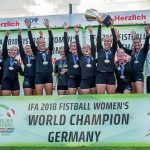 The IFA 2018 Fistball Women’s World Championship continues today with the semi-final matches. Host Austria will face the winner of the match Argentina versus Switzerland, and defending champion Germany will take on the winner of the game Poland versus Brazil. We will also see the three round-robin matches of the newly established President’s Cup, featuring the Czech Republic and newcomers Belgium and New Zealand. Furthermore, the game for the seventh place in the tournament will take place between Italy and newcomer Serbia. The young Serbian squad has played an excellent tournament thus far. “Our team is highly motivated and committed. We have a very young squad which is gaining its first experience at an international tournament. We would like to build on this experience for the future”, says Serbia’s assistant coach Edi Hagen. Altogether eight matches will be played today. Please, note: the time slots for the games number 39 and 40 have been swapped, as have those for the games number 42 and 43.